When Jeannine Scott first opened her doors eleven years ago, her motivation was deeply rooted in her background as a nutritionist. She found that dining in Montreal usually means one of two options : Great-tasting, real, wholesome, creme-de-la-creme food for those who can afford it, and over-processed, mass-produced, low-quality cheap food for everyone else. 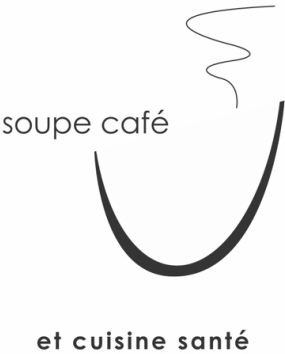 Soupe Café answered the need for an unpretentious restaurant that offered simple, wholesome, and homemade meals at an accessible price point - a place you could eat at every day without hurting your body or your wallet. Soupe Café has now evolved over the past decade to be more than just a place to eat that feels like home. Jeannine's recipe book has grown to boast over a hundred different soup recipes, health-conscious baked goodies, seasonal salads, artisanal sandwiches, classic dinner-time staples from hearty pasta dishes to a wide variety of omnivorous meals. To further her mission, Jeannine has lead her team at Soupe Café to contribute to the community through various food-related charities and social programs, helping even more people eat real food made with love. Drop by our open-kitchen café in Saint-Henri for a bowl of comfort and nourishment, served by the people who made it, with a smile. See what's cooking today by checking our café's daily menu, or peruse our catering menu for your next event.